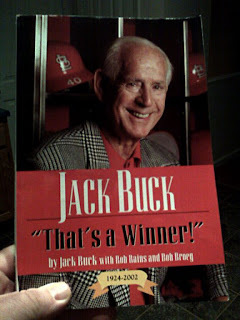 A lifetime Cardinal fan and from a family where Cardinal baseball is a form of religion, there is only one voice, Jack Buck. I remember as a kid my parents turning down the sound on the TV and the radio up so we could here Jack call the game. I had the honor of meeting Mr. Buck one time. He acted like we had known each other forever. I recently picked up his autobiography on Amazon. It is what I am reading now. It is the picture of the day.